We study rank fluctuations and find that it's common for keyword rankings to be erratic for large or complex websites. Positions drop and landing pages swap as Google attempts to identify the most relevant page or pages for a query. To help sort out what's happening, we've developed a landing page monitor that shows all the landing pages that have ranked in the top 20 search results during the selected reporting period for a specific keyword. This allows you to not only see the top landing page for a keyword, but all landing pages for that keyword during the report period. Coupled with a display of Google Algorithm updates, and any campaign notes that you may have recorded, this tool can help you determine when and why the rank fluctuations have occurred. And you can then strategize performance improvement. The Landing Page Monitor is located in the Reports > Rank > Landing Page Tools section of Rank Ranger. The Landing Page Monitor reveals a list of all the ranked landing pages in the top 20 search results for the selected keyword and time period. In this example, the bold tones color palette has been selected to display the three landing pages that were ranked in the top 20 search results for the keyword being analyzed. This report monitors landing page flux and provides a summary of the current rank, traffic, search volume, and number of search results for the keyword based on the last day of the report period. Hovering over any date point on the graph, the landing page URL and its rank display. If Notes or Events have been set to show, then that additional information overlays the graph providing a visual measuring point for landing page stability or fluctuation that occurs after the action indicated by the note or event. In this example, the site is being tracked on Google Mobile and two of the landing pages were presented in Google SERPs with breadcrumbs, image thumbnail, ratings, and AMP. In this example, the Landing Page Monitor has been added to a marketing dashboard and is displaying Google Algorithm Change, and utilizing the custom report title feature, and Bright Tones color palette. Select the date range in Report Options or use the calendar tool in the upper right section of the screen. 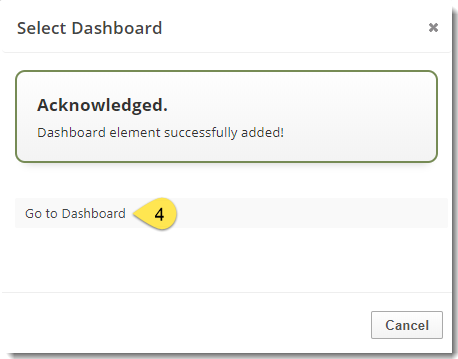 Enter a Custom Report Title (optional) enter a Title to display centered at the top of your report. This title will also display on your white label PDF reports; both in the bookmarked links and at the top of the report. Algorithm Updates: displays in the graph a red bar that when hovered over provides details of Google algorithm changes that have occurred during the report period. Click the Add Note link to add one or more to the report period. Select one campaign keyword to analyze landing page flux for. Select the primary domain or one of the competitor domains that you want to analyze for the selected keyword. Note: SERP features are available for Google desktop and mobile search engines and will display in the report if they are relevant to the current day's search results for the selected domain and keyword. Select a color palette to be used in the graph . PDF Report Content screen, then click the Add Report button and select the Campaign name and Report: Landing Page Monitor. Expand the Date Options section and in the Show Report data of the last field type in the number of periods to be displayed in the report. Select one campaign Keyword to analyze landing page flux. 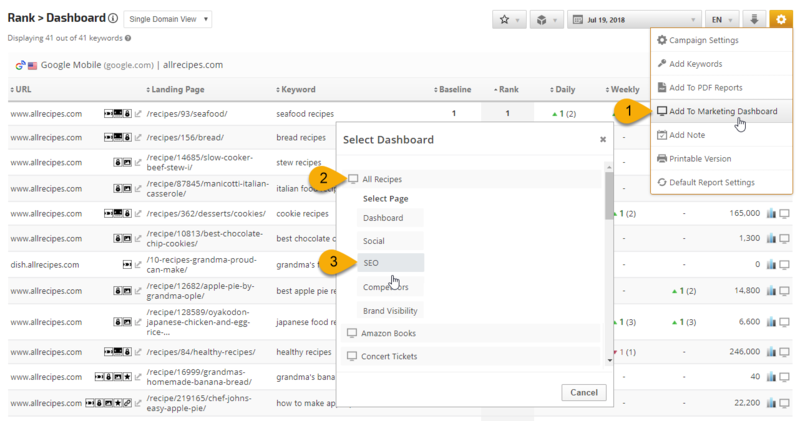 Select the primary Domain, or one of the competitor domains, that you want to analyze for the selected keyword. Select a Search Engine. Note: SERP features are available for Google desktop and mobile search engines and will display in the report if they are relevant to the current day's search results for the selected domain and keyword. Expand the Color Palette section to select a color palette to be used in the graph.